Keep your golf swing safe! Golfers endure a lot of spinal injuries. This is a common occurrence because many lack the required fitness levels, optimal flexibility or maximum strength required to be really good at this game — and not suffer injury. Did you know that a golf swing can be measured at 160 km per hour? As a result of this swing intensity, an overload of stress is placed on the muscles, bones and joints of the body. The smart golfer knows adherence to certain principles will help to not only improve their game but help them avoid injury. Strength training: Strength training should be performed as a regular routine. The muscles of the body act as shock absorbers, so it’s important that they remain toned to prevent sprain or strain injury. The most important muscle groups in this case are the core, chest and back muscles. Warm up and cool down: A brisk walk, simple range-of-motion stretching exercises or a gentle jog will help to increase your heart rate and will automatically start to loosen your joints. This should take place before and after your game for about 20 minutes. Hydration: When you’re dehydrated, you’re at risk for injury. Water is the most important fluid, and beer or other alcoholic beverages are not good substitutes! Once you realize that you’re experiencing thirst, you’re already far down the path of dehydration, so drink a lot of water. Use a wheeled golf cart: Make sure also to push your cart and not pull it. If you have to carry your golf bag, try to use both shoulders, or at least alternate shoulders every 20 minutes. Invest in good golf shoes: Take care of your feet by purchasing good footwear, and always buy golf shoes with short cleats. While standing, always alternate your weight from one foot to another, and if you need to put your foot up on your golf bag, go ahead. Customize your style: Always use the techniques that are right for your physical capacity and limitations. 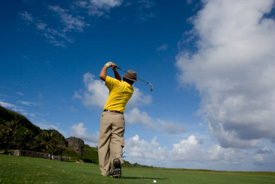 Adapt your swing with the help of a pro, based upon your age and your flexibility levels. Consider shortening your backswing if it helps to reduce the extra twisting that aggravates the shoulders and neck. Most professional athletes, as well as weekend warriors, also use chiropractic care as a preventative measure in avoiding injury, as well as ensuring speedy recovery when one does occur. Chiropractic keeps your spinal biomechanics in top playing condition; don’t play without it! I believe backache is the most common injury when it comes to golf! My dad suffers it now and thanks God that he 's getting better and ready to come back to the green grass!